Have you seen the Sea Resort 2014 collection yet? Be careful because it may tempt you to get out your credit cards. The New York based contemporary brand known for sporty separates has brought a collection filled with pieces equally fit for battling big city sidewalks as they are walking down a beach in Mexico. Speaking of walking down a beach in Mexico, I wish I would have snagged their new baja inspired hoodie and matching shorts before I left for my trip to Puerto Vallarta this morning. Not to rub it in, but I'm off to soak in some sun and do some wedding planning:). I will however be investing in one of their eyelit dresses for our pre-wedding festivities this spring. Sea is a contemporary to better priced line which means when it goes on sale it becomes a great fashion score. At the moment I'm coveting on sale items including this plaid mohair cardigan jacket and lace tee. 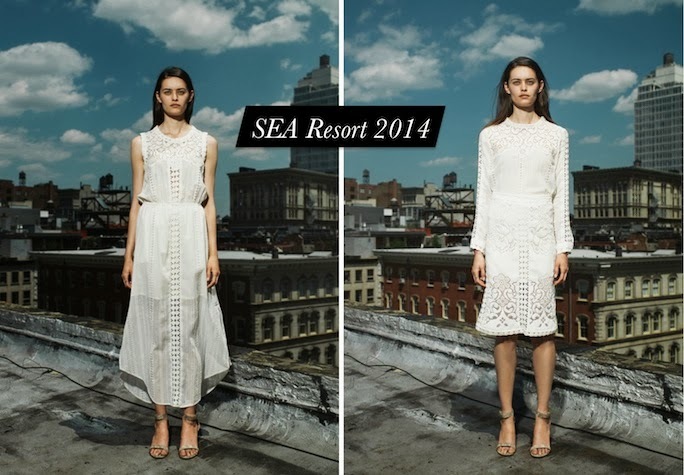 The Sea Resort 2014 collection is available here, here and here. What a great collection!! I really love the striped skirt and the white flowy dress! This collection looks so beautiful. I love being exposed to new collections on people's blogs. My favorite look is the striped jacket with toggle buttons. That's not a combination that I see very often. I love all the collection, I want everything!! The second white dress is to die for, I'm obsessed! <3 stunning! Beautiful items and designs. I love the simplicity of the line. These outfits are all great to wear to the sea.